I rarely stray from my usual skincare regime. I feel like I've got it just right, and because I have normal skin I don't have too many issues that I need to rectify with skincare. However, I was feeling like a toner was missing from my routine. I wanted something gentle and refreshing to use after cleansing to make sure my skin was completely clear and ready for moisturiser. I am still contemplating getting the Pixi Glow Tonic after hearing constant good things about it for around 2 years now, but until I pluck up the courage to spend that much on a toner, I thought I'd give the Nivea Refreshing Toner a go. And I have to say I'm really impressed! Like I said, I just wanted something refreshing, and this does exactly that. It makes my face feel really fresh and clean, and, whilst it isn't unscented, the scent is very mild and just smells fresh. If you've tried Nivea products before, this toner basically has the same scent. I just use this AM and PM after cleansing and, whilst it's not done anything spectacular to my skin, I've been enjoying it and for less than £3 you can't complain! 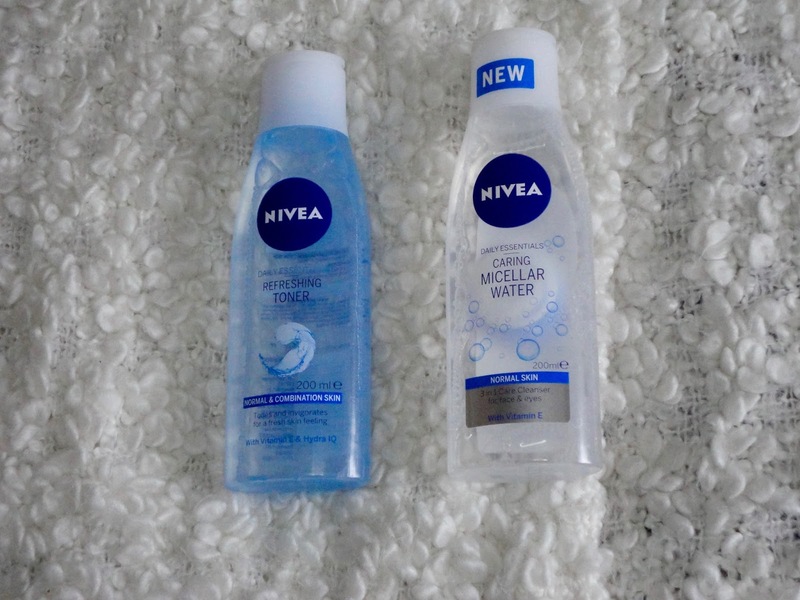 Secondly, as I ran out of my usual L'Oreal Micellar Water, I decided to try the Nivea Micellar Water. This is a new product, and as it was on offer, I thought I'd give it a whirl. Unfortunately, this hasn't been quite as successful as the toner! They have an option for dry, sensitive and normal skin, so I picked up the normal skin one. I just found that this doesn't take my makeup off as effectively as my L'Oreal or Garnier Micellar Waters! Obviously, there's not much more to say about a micellar water, but this has just disappointed me as I'm so often left with black still all around my eyes after using this - which just means using more and more product and cotton pads! As I generally like to wear a full face of makeup, I thought I'd be a good tester for this and it just didn't perform very well! The mascara that I wear isn't even waterproof, so I imagine it would not take off waterproof mascara at all! I think from now on I'll be sticking with my L'Oreal formula. Yes, the Nivea one is cheaper but not really good value for money when it's not doing it's job properly! Have you been trying any new skincare at the moment? Let me know in the comments!